bit too informal for some uses (but could be nice for the wiki). etc.) But perhaps that is not what you wanted? > I made this logo in February 2018. At the time, I was planning to do some video tutorials on ConTeXt (still work in progress), and I wanted a nice looking visual clue for the thumbnails. Recently, I made a few minor tweaks and thought it would be the right time to put it out there. > The logo comes in two different layouts (hexagonal and horizontal), and each layout comes in two color variations (multicolored and blue). > The hexagonal layout is borrowed from the unofficial ConTeXt logo that has been around for some time. I like the idea of a clean geometrical form, and the hexagon reminds me of chemistry formulas -- one of the many application fields of ConTeXt. > The seven colors have mainly an esthetic purpose. They also denote the flexibility of ConTeXt. I've added a monochromatic blue version because shiny, saturated colors are not suitable for every case, and blue is strongly associated with ConTeXt to me. Blue is also a reminder of Mark IV and LuaTeX. > The letters are set in Din17 EF, which I've licensed. I like its simple shapes combined with a round and soft touch. It avoids consciously the very connoted Computer Modern and can be seen as a modernized and also Europeanized interpretation of the TeX tradition. > This logo is just a humble proposal. Perhaps it is of some use to someone. It could also make someone else want to create and share his or her logo -- that would be great. 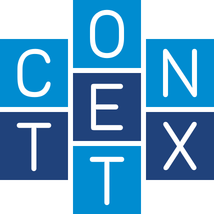 > I'm using ConTeXt since 2006/07 for almost everything that contains text: letters, presentations, invitations, résumés, certificates, manuals, reports, flyers, university papers, book typesetting, exercise sheets, song sheets, and I'm still amazed by how powerful, flexible and reliable it is. Thanks to the whole community -- and particularly to the Dutch wizard -- for making this possible!